Pata Market at 81-16 Broadway in Elmhurst, Queens has won me over with their prepared food, particularly the savory items like this Sai Oua. 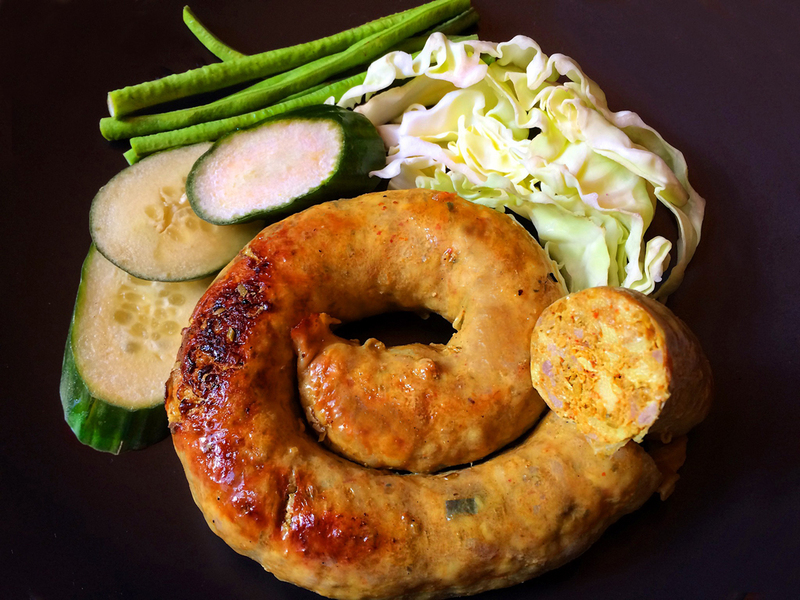 Sai (intestine) oua (stuffed – an apt description of sausage in general) hails from the northern region of Thailand. The stuffing is ground fatty pork with that immediately identifiable, signature northern Thai flavor attributable to chilies plus some combination of shallots, garlic, lemongrass, galangal, kaffir lime, fish sauce, turmeric and red curry paste. Pata Market’s was right up there with my favorite renditions. In addition to both sweet and savory items displayed on tables (most of the shop is given over to those), there are freezer cases and reach-in refrigerators protecting perishables and hard-to-find ingredients like crickets and silkworms for the culinarily adventurous. This entry was posted in Good Eats, Instagram, Shopping and tagged Thai by Rich. Bookmark the permalink.